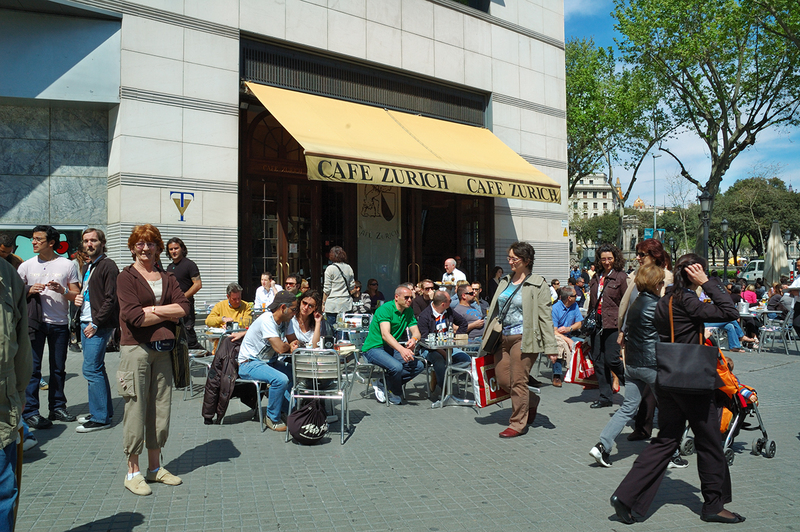 This is a snap I took of famous Café Zurich located at carrer Pelai 39 or Pl. Catalunya,1. Better said, this is a reproduction of the original. The well known café was founded on November 30th, 1920 on a canteen for trains going to Sarriá. In the 30s one coffee there would only cost you 1 or 1,50 pesetas! I digress. Back in 1994 the whole block called the Golden Triangle was completely restored and important department stores and offices were built. Café Zurich was no exception and according to purists it is not the same in spite of official promises to keep it as it was. It is a good place for coffee and pastry although not the best. Tourists seem to enjoy the terraces as you can see in the picture. Locals do the usual thing avoid it during the high season. Beautifull and colorfull shot ... well done! Very nice lively street scene too! Nice slice-of-life. Looks to be a warm and friendly place to spend an afternoon. This is something I so miss here in England. The casual way one can sit on a terrace, something not done here apart from a few country pubs. And then they call it a beer garden.